Life science IT departments face increasing demands because of clinical trials’ growing complexities, including the proliferation of specialized applications, ballooning numbers of stakeholders, and data security and privacy considerations. On top of these demands, IT departments are having to rely on monolithic legacy systems that are made up of tightly coupled applications. These systems often use dated file formats and transport protocols that require specialists to operate and maintain. They drain IT budgets due to ongoing maintenance, hinder agility with complex code that can’t be reused, and prevent real-time data access. In short, these legacy systems make it incredibly difficult to develop new applications. Between those clinical trial complexities and legacy systems, life sciences R&D departments face a jammed pipeline. Even worse is that stakeholders receive a disconnected digital experience. The 2018 MuleSoft connectivity benchmark report shows that 63% of customers would switch brands for a better, connected digital experience. A lack of consistency across business channels can lead to revenue loss, damage a business’s brand, and slow a company’s ability to launch new services efficiently. That’s a big challenge. So how do we solve it? We can’t change the complexities of clinical trials, but we can modernize legacy systems so that they can coexist with cutting-edge technologies. This modernization can help IT departments provide a connected, consistent digital experience by offering a 360-degree view of customers, business automation, and infrastructure. But not all modern systems are created equal. Establish an overarching digital strategy that aligns with the business challenge. For example, improving investigator and patient experiences during the clinical trial process requires a digital strategy different from one aimed to improve collaboration with contract research organizations (CRO) running the clinical trials. Determine how to focus the digital strategy to support the business challenge. For example, to improve CRO efficiency in running clinical trials, enable access to a standardized set of digital productivity tools that support trial administration. Or to increase the effectiveness of CRO in-house applications, provide the CRO self-service access to your data. Identify the target audience for the digital strategy, and ensure that business and IT departments are aligned on this audience. During the process of designing, sharing, and updating the APIs that support the digital platform, the business and IT departments must keep the target audience front and center to achieve a consistent and successful digital transformation program. 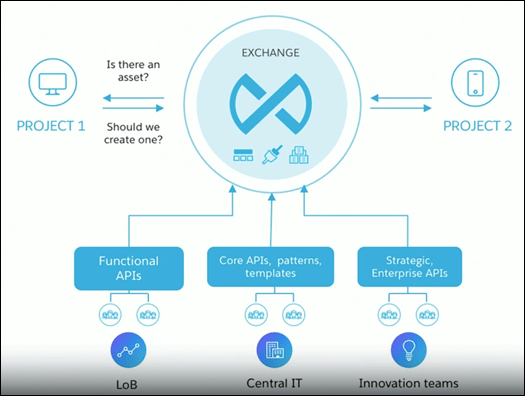 MuleSoft’s Anypoint Platform is purpose-built to enable the development of an application network through API-led connectivity. Businesses can use Anypoint Platform to rapidly connect their assets to one another. From a single platform, developers can design, deploy, manage, and secure APIs. They can also reuse examples and templates to accelerate app development. Finally, the platform allows businesses to automate processes to streamline their operations. When combined with Salesforce, which enables solutions at the application level, Anypoint Platform can help scale connectivity across different parts of the R&D life cycle. This powerful combination provides a unified, efficient R&D process to power collaborative product development, leading to success at every phase of the R&D pipeline. And as a result, customers gain a connected digital experience. In the healthcare industry, when specific industry safety signals are triggered, updated safety product labels must be created. This safety mandate protects Amgen’s stakeholders—the physicians and patients who rely on its safety information. But Amgen was using a legacy labeling system that required manual processes that were often disconnected from one another. The system lacked end-to-end visibility, and it had a lower success rate of correctly creating labels on the first try (Right First Time labeling). Amgen discovered Anypoint Platform, the API-led connectivity platform that could meet all LEXA integration requirements. Using MuleSoft’s API Design Center, Amgen was able to implement an API naming convention that mapped to business capabilities, making its labeling processes more transparent. Amgen also created APIs in RESTful API Modeling Language (RAML) with data examples in the tool. And it used API Designer’s mocking services to immediately provide working endpoints for developers to test their APIs on. Amgen took advantage of Anypoint Exchange to publish and reuse its assets. These assets were easily discoverable thanks to the standardized naming conventions (developed in API designer), allowing Amgen’s developers to drive efficiency and collaboration across the business. To track its API usage and performance, Amgen enlisted the help of API Manager. Amgen could actively use alerts configured in API Manager to know when APIs were exceeding performance thresholds. With Anypoint Studio’s drag-and-drop interface and pre-built connectors for existing systems of record, Amgen developers were able to rapidly develop integrations across the business. Amgen not only innovated to create a new, exponentially improved labeling process, but it also created a new integration model shared across the business. Agmen is just one example that demonstrates how Anypoint Platform enables rapid API-led connectivity in mission-critical initiatives for the life sciences industry. To learn more about how Amgen used Anypoint Platform, check out this recorded Dreamforce 2018 session. For other ways that APIs can enable R&D digital platforms, read MuleSoft’s whitepaper on Modernizing life sciences product development with APIs.